Do you ever mess up a recipe and then decide that you liked it so much you couldn’t have it any other way? 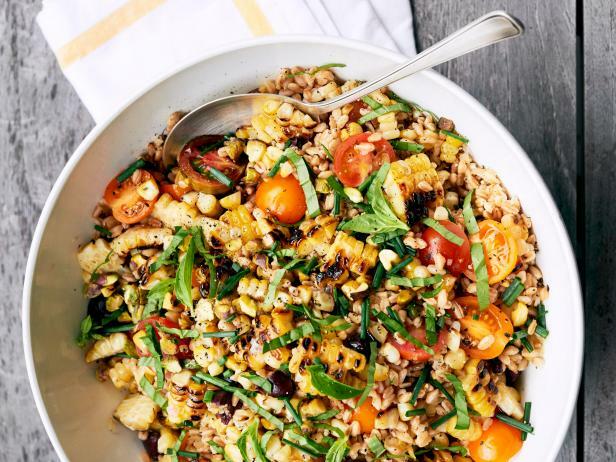 Well, that’s what happened to this Warm Farro Salad with Charred Corn from the July/August Food Network Magazine. It turned out to be a happy mistake. So I’m going to tell you how I made the Warm Farro Salad coz I will make it every time this way. I made a few other changes, too: I typically down play the grains and up the veggies in a salad like this. What I got was a bright and fresh salad full of all the goodies: charred corn, cherry tomatoes, & Kalamata olives. The biggest surprise was how the lemon really stood out in this salad, which I loved; maybe that’s because I cut back a little on the basil. I don’t know if it’s because I grow my own herbs and they’re fresher than what you buy at the grocer’s but sometimes the amount in recipes really just bowls me over. Anyway, when you buy Farro, check and see if you can’t get it from the bulk area of the store or a health food store rather than paying a ton of money for those little packets you find near the rice. You’re likely to find corn (see how to pick a good ear) and tomatoes on special all summer long; just make sure to use that corn asap when you get it home. The red cherry tomatoes are usually less than the “heirloom” mixed but Aldi is a great place to pick up either on the cheap. (I think they even have farro there, now.) Even less, although not as pretty, is a regular sized tomato. Chunk and strain it for a few minutes. I love cutting my corn over a bundt or angel food pan – it makes the job so much easier! Thanks to Real Simple for the photograph. Preheat a grill to high, then start cooking the farro on the stove-top. While the farro cooks, you’ll grill the corn. After the farro has rested for the five minutes, add about 3/4’s of the vinaigrette, and gently toss with a fork. If the amount looks overly generous, don’t worry, the farro will absorb it. Hold about 1/4 of the vinaigrette back in case the salad needs to be moistened a little or needs to be punched up before serving. While the farro is cooking, brush the corn with a tablespoon of oil. Season with salt and pepper. Cook on the hot grill, turning with tongs, until slightly charred, 8 to 10 minutes. Cut off the kernels. Add the corn kernels, tomatoes, olives, red onion and chives to the farro. Gently toss to combine; add more vinaigrette if desired and season with a good amount of salt and pepper. Garnish with the basil. I’ll be taking this recipe to Angie’s Fiesta Friday , hosted this week by Liz @ spades, spatulas & spoons and Jenny @ Jenny Is Baking. If you have a minute, click over to Fiesta Friday & see all the link ups, or Liz & Jenny’s blogs. This entry was posted in Click here for Fabulous Food Posts and tagged Cherry Tomatoes, Corn, farro, food network, Frugal Hausfrau, hearty sides, Lemon, Olives, Red onion, Salad, Side, Tomatoes, Vegetable Side, Whole Grain. Bookmark the permalink. Hi Mollie!! I just like to hear from you whenever you can squeeze it in!! We are still in Wisconsin for about a week– hanging out with kids and friends here. The wedding was big fun– pics soon!! Hugs!! I hate cutting corn, that’s a great tip! I haven’t tried farro but I do have a bag of kamut that I have no idea what to do with. I think I just like the name. Maybe I can use that? But of course I don’t know if they taste similar or not. You could try it. I haven’t used kamut (and it is a cool name) in anything but my Muesli. It has (to me) a very sweet taste. I think this would be great with barley or quinoa, though! ps – I thought you were supposed to be on vacay, girl!! My kinda salad 😀 Looks great! Thanks Sonal! Yes, we’ve been missing you! This is my kind of salad! It looks so good and perfect for summer. Thanks, Carlee – it just kept getting better. It made a lot so I had leftovers so I think it would be a perfect potluck or picnic dish and perfect to make a day ahead. Looks so delicious, makes my mouth water just at the sight of it! Like the simplicity of this recipe and would add lemon too! An amazing refreshing salad! And a great corn trick. Loved it!! Great corn trick Mollie…. The salad looks so satisfying. And that charred corn, wow! Been making a few salads like these myself, I’ve only cooked with farro once, I like the idea of upping the veggies. I bought Farro a couple of weeks ago and didn’t do anything with it. This looks like a great way to use it. I love the trick about the corn! Hi Ronit! That was sweet! I’ll be right over to check yours out – still have more farro, lol! Update: I just stopped by and if anyone reads this, click on Ronit’s name and go right over to her blog right now and see what deliciousness she’s prepared! What a lovely salad – I can imagine eating this on a restaurant deck for brunch.